How do I connect my IMAP email account to Nimble? IMAP is one of the most prevalent Internet standard protocols for email retrieval. Virtually all modern email clients and mail servers support this protocol as a means of transferring email messages from a server. Nimble connects to your email over IMAP to bring together all of your conversations from all of your email clients such as your smartphone or your desktop email program and we collect emails in Nimble and relate them to your contacts. To use IMAP with Nimble, you must first make sure IMAP is enabled in your email provider's settings. Please check your settings or contact your email provider to make sure you have IMAP enabled. Nimble does not support POP3 email for Nimble. 1. Go to Settings >> Networks & Imports and select "Email Accounts", then "IMAP". 2. Enter your email address and password. Nimble will try to detect your email provider and connect the account for you! If we are not able to locate your email provider based on the information provided, select "Enter Credentials Manually". If you are unsure where to find this information in your email client outside of Nimble, please follow our instructions below for help locating the proper information. 1. Go to Tools >> Account Settings. 2. Select your email account from the left side of the Account Settings dialogue. 3. This will display your server information to translate over to Nimble. 1. Go to Tools >> Accounts. 2. Select your email account and click Properties to display your server information to translate over to Nimble. 1. Go to Preferences >> Accounts. 2. Copy down your email account information and translate it over to Nimble. 1. Go to File >> Account Settings. 2. Select your email account for details. 3. Translate your email account information to Nimble. (Please note when Apple's two-step verification is on, it may block Nimble from accessing your account unless you have set up an app-specific password. Apple goes into more detail in their support article here.). If your Office 365 email account is on your own domain, you may need to contact your IT admin or email provider for the correct server names and port numbers. (Please note when Office 365's two-step verification is on, it may block Nimble from accessing your account unless you have set up an app-specific password. Microsoft goes into more detail in their support article here.). To set up with Microsoft Exchange, please contact your company's MS Exchange administrator to share the IMAP account details with you, as it differs for every account. Source: GoDaddy provides more information here. "The specified SMTP host doesn't respond. Make sure the host name you entered is correct." - Incorrect SMTP host name. - Your email server may need to whitelist Nimble's server IP ranges (Please email us for more information). - Need to verify that account is set up for IMAP and not POP3. 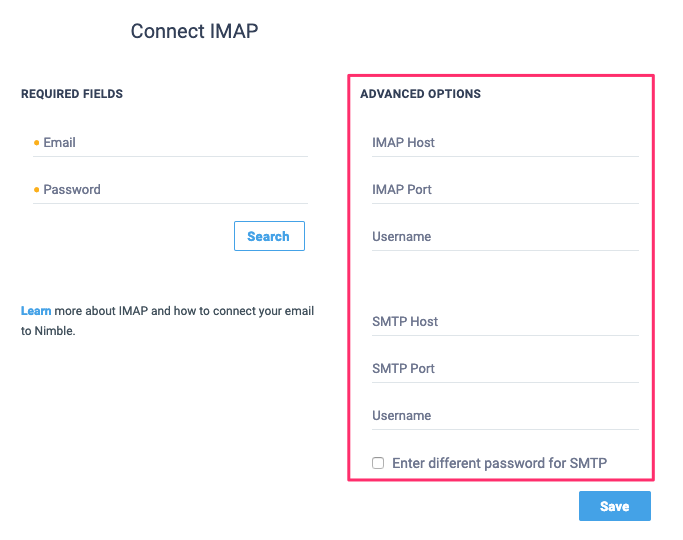 If none of these solutions work, please test out your account by using the same IMAP/SMTP credentials on another email program to see if you can connect. Some example programs are Apple Mail, Mozilla Thunderbird, and Microsoft Outlook.